A twisting thriller with fantastic performances from the two leads, reminds a lot of old thrillers from the late eighties and early nineties. Nick and Amy are happily married and live together as writers. He is a simple but handsome and likeable soul while she is pragmatic, beautiful and slightly aloof. But when one day Nick returns home to find Amy missing and the house becomes the scene of a crime, he finds himself under scrutiny in a police investigation and mystery that quickly grips the nation. What happened to Amy? It is very hard to talk about Gone Girl without spoiling most if not all of the film, so I will endeavour to restrain myself. Ben Affleck and Rosamund Pike have never been better than in this film, especially Pike who might very well be onto a career defining role here. The characters aren’t the only well defined element here, but the depiction of the media and how it affects the masses, showing people en masse as a fickle mob that will lash out at whoever they are told to. One example, no spoilers, is best shown early on when Affleck’s Nick, dazed and bewildered by his predictament, absently smiles once during press photographs. This one moment is seen blown out of proportion as a media frenzy calls it proof that he murdered his wife! Whether he did or not, the sudden backlash over such a small detail is very well implemented here. The film starts out strong, running two stories parallel with Nick’s current predicament and Amy’s diary leading up to her disappearance. The police investigation is spearheaded by Kim Dickens as Detective Rhonda Boney, and her cool calculated start to the case both comforts and threatens Nick in equal measure. I would say the film loses its integrity a little in the third act, not to give anything away, though the audience has to give the film a little benefit of the doubt. I saw what was being done, but the implementation felt a little rushed towards the end. I might also say that… it was a little predictable. Not to say that it wasn’t incredibly suspenseful! It certainly was, and the characters were all so well portrayed that I scarcely noticed the one-hundred and fifty minute runtime pass! But even a little reading between the lines will probably show you what’s really going on. 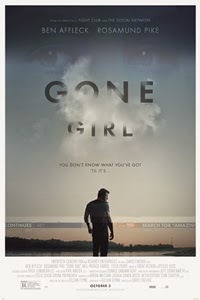 I wish I could say more, Gone Girl is packed with suspense and thrills (and even some nice humour) it is bleak at times, sexually charged in others, and overall a very rewarding piece of drama.